People (0f Earth…or wherever you dwell) I really am not known for getting mad. Simply put, the act of being angry, when it naturally escalates, results in fisticuffs. Let it be said, I would only be minutely successful in brawlin’ because people would have to get over the sheer shock that Nick White, who normally utilizes verbal abuse of the rhetorical and sarcastic variety, actually hit them. After the person manages to “get over” that mindsplosion, it’d be all over for me. 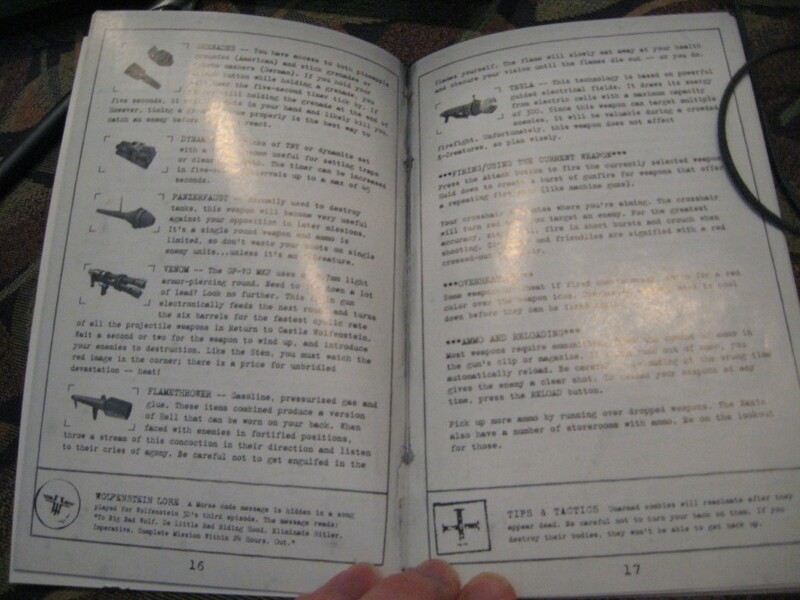 With that in mind, I present you with today’s “largely insignificant rant” topic: The slow decline of the game manual. Granted, I don’t want to turn this into a de-facto lecture of sorts on “The History of the Game Manual” but it is fair to sum up such with this statement; the game manual (along with the additional contents that would accompany such) used to be a book in its own right. I still remember the sheer horror as a child when I opened the box for Carmen Sandiego and found a hand-held encyclopedia, which my father told me was the game manual. This, of course, was back when games came in boxes of virtually any shape and size, and I’m certain that manufacturers and distributors of said titles were the last people to complain about such. Games used to come with (regardless of the type of game) supplementary books, comics, artwork, music CDs, and sometimes sealed envelopes and/or props essential to the actual gameplay of the game. Granted (and this is probably digressing already) a lot of those items were some of the earliest forms of copyright protection: code wheels, as well as manuals that contained passcodes or CD keys that would have to be entered at various points in the game, ensuring that anyone who simply copied the original disc would find the game unplayable. Let’s be clear. I’m a reasonable guy, and I like the standardized box size that console games have embraced. They look great on my shelves that way, and no longer resemble the spastic bar graph that my PC games used to. It’s also great to find a compromise in durability and size between “I break them without trying” Jewel cases and lugging around the entire game box’s contents. But, there is one thing that has disappeared from last-gen to current-gen titles, and because game box/case design is virtually unchanged (aside from color and minor size adjustments) there’s literally no excuse for it: color manuals. Allow me to pre-emptively address those forward-thinking individuals in my readership that are wondering why manuals are necessary in the first place when sites like Replacementdocs (the site’s down right now, but should be up soon) and GameFaq’s guides demonstrate the ease of producing a manual in PDF/Rich text format. Aside from the casual gamers that aren’t “Net savvy” enough to hunt down this stuff presently (unless this is made drastically easier) the undeniable truth is that the video game companies themselves are continuing to produce manuals. Obviously, they don’t think abandoning the booklet format is advisable either. Yet, apparently, going from a color manual with a page count in the double digits (and even the more intuitive and simple games are still capable of such) to 3-5 black and white pages of text is perfectly fine. Maybe I’m old-fashioned, but I feel that every aspect of a game suggests how much pride the development/marketing/production team/s put into the title…and box/liner art, CD art, and the manual are no exception. I love having a manual that embraces the aesthetics of the game, includes some game art or concept drawings, and hopefully continues the high production values of the title itself. 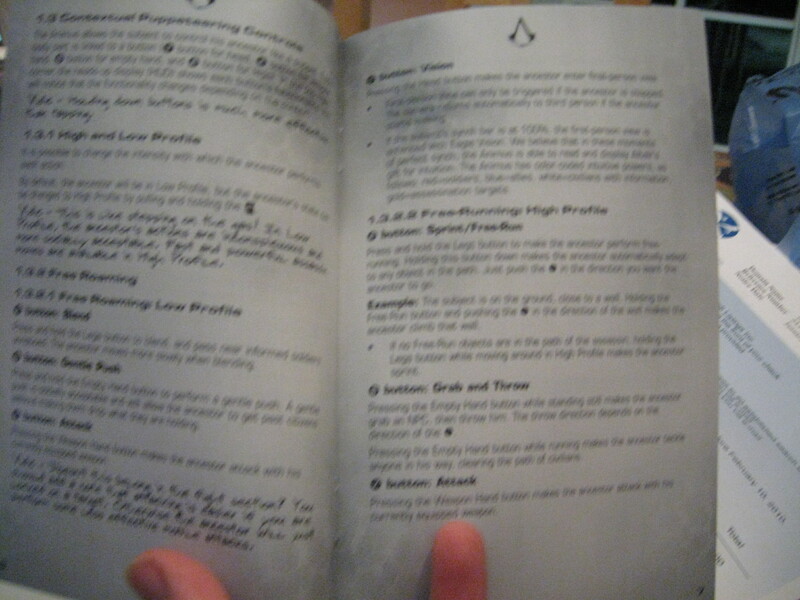 And, while I might be the only one that has this tradition, I love at least leafing through the pages of the manual before actually starting up a game. I know…I’m a big softie. But maybe I’m just waxing nostalgic…maybe last generation’s games were just as culpable as this generation’s (which, really, there’s little to no debate on the fact that current-gen titles mostly lack color manuals), and thus my argument is moot and void. I know what you’re thinking about that too; “But Nick, we know you’re not dumb enough to stage an argument that you know you won’t win.” Oh really? I don’t think these things through. That’s why it’s a rant and not a “well thought-out and methodically crafted” argument. So, first I went and grabbed some of my original Xbox games that I’d recently bought from GameBoss, a handful of GameCube games, and some Xbox 360 games, and attempted to arrive at some conclusions. And, while I don’t need to say it (I’m still going to) there are obviously exceptions to all of these rules. Now, who am I referring to when I say “BIG?” I’m talking EA, Activision, and Ubisoft (the third one I’m not as certain on in past years, but the past two or three, I think it has solidified this position…feel free to debate if you think otherwise). Yup, we’re talking big-budget titles like Assassin’s Creed, Call of Duty, Marvel: Ultimate Alliance, X-Men Legends, Mercenaries 2, Madden, Ghost Recon, Rayman. Are these guys strapped for cash? Unless we’re about to rapidly redefine the understanding of just what “strapped for cash” means…then no. So you want proof? Or some minimal photographic evidence? Well, here’s the manual of the “oh-so expensive” Assassin’s Creed (2007, Ubisoft) on the left, and Return to Castle Wolfenstein (Activision, 2003) on the right. Activision's Return To Castle Wolfenstein at least has neat facts about the franchise's history on the bottom. Could I be a hand model? Well, I'd have a better shot at that than "professional photographer." Conclusion #2–First-party publishers (Sony, Microsoft, Nintendo) always have color manuals…again, regardless of last or current gen.
Is this really a surprise? I mean, honestly? If there’s any of these conclusions that you likely could have gleaned or known (or at least, assumed) without my assistance it’d be that the head honchos of the console war take care of their own. I’m certain none of these three want to be accused of being “cheap,” and the (at least, attempted) mentality of “Keeping Up With the Jonses” probably keeps any of them from having second thoughts about this cost cutting procedure. Wanna list for this too? 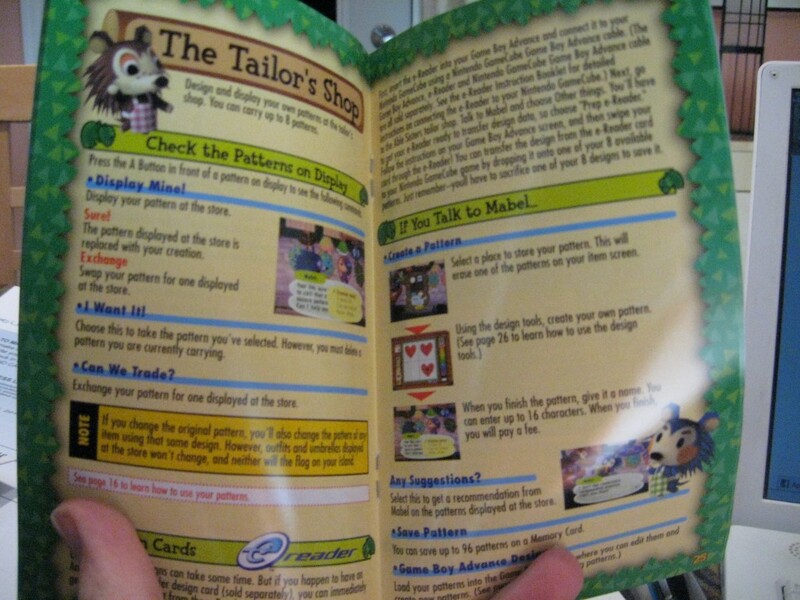 Upon inspection HALO, Super Mario Sunshine, Eternal Darkness, Animal Crossing, Custom Robo, Fable 1&2, Luigi’s Mansion, and Jade Empire, amongst others, ALL had color manuals. Pictures too? I’m on it. That’s Animal Crossing (Nintendo, 2002) on the left and Crimson Skies (Microsoft Game Studios, 2004) on the right. I.LOVE.THIS.GAME. Messing with the internal clock FTW! I will say this, Microsoft really knows how to make great-looking manuals. 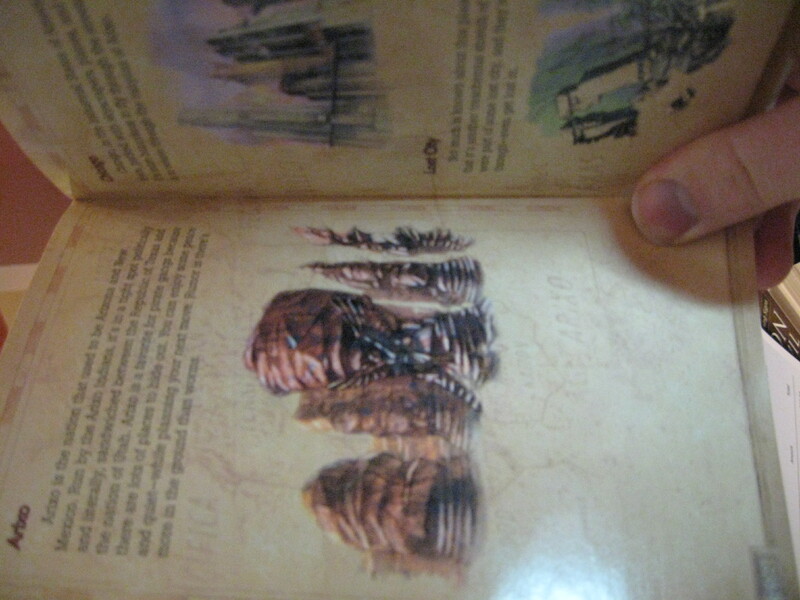 Beautiful concept art drawings of locales, character profiles...you just don't see this stuff anymore. Conclulsion #3–Well…to tell you the truth, from here, the rules aren’t so absolutist. By the use of deduction, we’re left with smaller third-party publishers (SEGA, 2K, Lucasarts, indie/self-published, and the like) and second-party developers working for first-party publishers (though, most of these games end up under the rule of Conclusion #2). From here it tends to be more of a “company by company” policy as to whether or not they have color manuals, rather than last-gen vs. current-gen. SEGA, more or less (and damn them for it) have never released a game with a color manual. CAPCOM, most of the time, favors the color manual (Viewtiful Joe, Resident Evil 5) but occasionally uses the black and white manual (Dead Rising, Devil May Cry 3). Rockstar Games, both last-gen (I can at least speak for GTA: San Andreas) and current-gen (Bully: Scholarship Edition and Grand Theft Auto 4) has made some of the snazziest (Yes, I used that word) color manuals I’ve ever laid eyes on. And we’re not just talking about the obligatory “hot girl” that graces the cover of every GTA title. To at least add a few more publishers to the list Namco (now Namco-Bandai), Valve, and Codemasters, have stuck to color for both generations, while Atari and 2K have vacillated (2K’s The Darkness was black and white, while Bioshock and Borderlands were color) between the two. So, what can we glean from this? Like I said, with most of these smaller entities, most publishers have a policy they stick by, with occasional exceptions. For many, like The Behemoth, they’re lucky enough to land any publisher to put their game out there (Alien Hominid) that I can only imagine that a color manual is one of the last things they’re thinking about. There’s absolutely no denying, especially with the really small publishers, that money might be the deciding issue between having a colorful manual or not. Yet there’s still that undeniable urge that somehow, we’re seeing less color manuals this generation…but why? Well, I’ve got one predominant idea that might be sound. Many companies that, three-four years ago, were independent or second-party, are now officially under the banners of the “big three” that we discussed earlier. Pandemic, who was releasing color manuals under LucasArts (Battlefront and Mercenaries) joined up with EA. And, before they were dissolved, released The Saboteur and Mercenaries 2, amongst one or two others. Neither had color manuals. Granted, this might not seem like a big enough explanation…but when you add up all the companies that have joined the ranks of EA, or were a part of the Activision-Blizzard merger, it begins to add up. Final Thoughts–Overall, the question of the color manual begs another: is the color manual a proven indicator of quality games? I’m obviously not looking for a causal relationship here, merely an associative one. 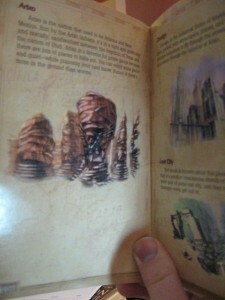 Do games, with color manuals, tend to be better games? Well, that’s a tough thing to prove, with only my game collection to prove it. Due to the fact that I don’t make a habit of purchasing bad games on a frequent basis, regardless of what some of my friends might say, it’s difficult for me to open those game cases and go, “Yup, bad games lack color manuals.” Can I say that, of the games I have, the ones I love the most, most of the time, have color manuals? A lot of them do. Perhaps it’s best to view the color manual as the last touch of polish on a quality title, when being reasonable. I love Marvel: Ultimate Alliance, but I don’t let the plain manual reflect on the title, because I know how Activision works. Alternately, I also love Alien Hominid, but I’ll let their minimalist manual slide, because of budgetary restraints. It’s certainly not a “make or break” criteria for games, but it is wonderful when the loyalty to the aesthetic of the game goes beyond the disc. And that, I do miss. 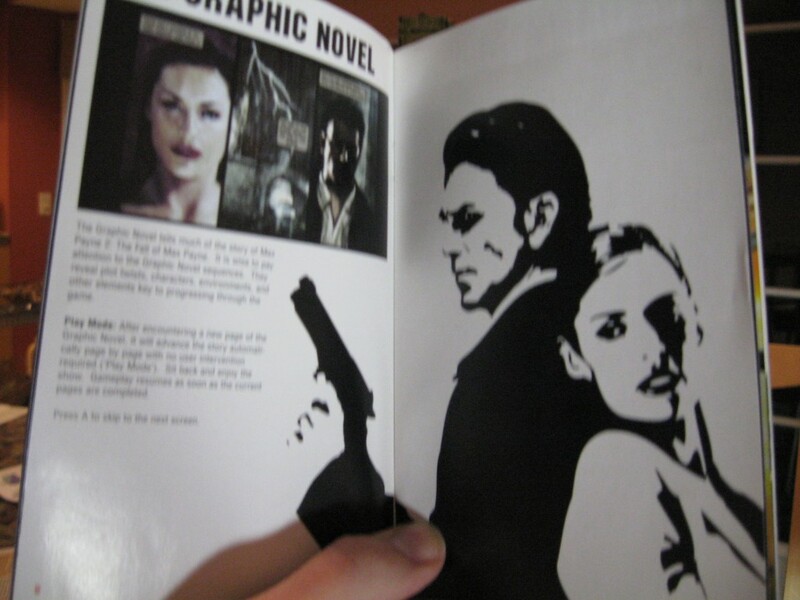 Yes, I know, sometimes this sort of stuff is difficult to articulate, so I’ve included this page from Max Payne 2: The Fall of Max Payne as an example. Images that capture the game's aesthetic and feel, which carry over both pages, and share the look of the box art? Wonderful...this is how it's done, guys. Yes! I don’t play video games, but I am totally irritated by cheap manuals. Your point that color manuals reflect the pride of the maker of the game is right on point…good presentation is vital. I fear it won’t be long now ’till actual manuals die out altogether, replaced by in-game tutorials, proper storytelling, tips & hints on loading screens, or lack of all-of-the-above.